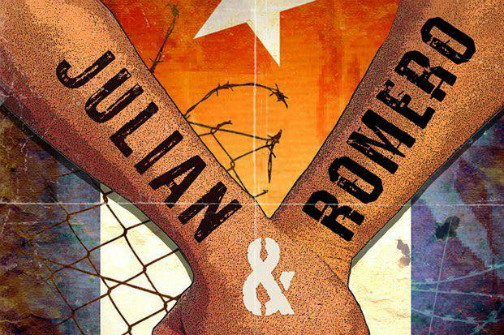 BOTTOM LINE: A must-see for anyone invested in socially-conscious new work, Julian & Romero is an important and relevant portrayal of human rights violations and transcendent friendship in a UMAP prison camp in 1960s Cuba. “You cannot approve the life of one person and deny the other,” exclaims Julian of Julian & Romero. This statement sits at the core of the piece, set in 1960s Cuba under the rule of Fidel Castro’s military regime. Julian & Romero aims to capture the brutality perpetuated against those who were deemed by Castro’s government to be “the scum of society” and sent to labor camps termed “Unidades Militares de Ayuda a la Producción” (Military Units to Aid Production). These camps, consisting of people who were considered “counter-revolutionary”—including homosexual men, intellectuals, and anyone considered an “independent thinker”—were notorious for their mistreatment of those imprisoned. Internees worked for the better part of each day, unpaid and under harrowing conditions. Julian & Romero focuses on the experience of one prisoner, Julian, and his guard, told in part through the narration of Julian’s mother, Bertha (Edna Lee Figueroa) and father, Raul (Jerry Soto). The piece opens with music and a series of projected images that work with the minimalist set to recall Cuba in 1966. We are introduced to Julian, as his mother narrates his arrest, and then to Romero, the soldier who stands guard outside Julian’s cell. The two, stark ideological opposites, discuss faith, music, sexuality, their families, and their dreams and nightmares. Julian reminds Romero that they knew each other as children, and maintained a close friendship then. When Julian is confronted and beaten by his father, who is also a high-ranking military official with authority over the camp, Romero steps in to defend him, and as a result, is thrown into prison alongside his friend. The most emotionally difficult moment of the piece comes at the end, as the two men contemplate the impending certainty of horrific electro-shock treatments, routinely administered to “cure” homosexuality.